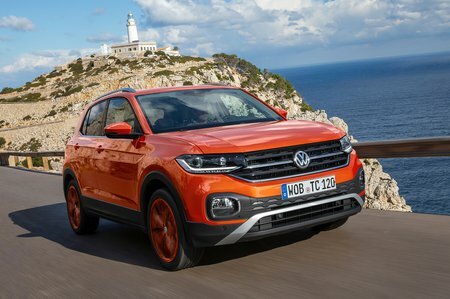 Volkswagen T-Cross Performance, Engine, Ride, Handling | What Car? There are only two engines to choose from, and both are petrols that are 1.0-litres in capacity, with three-cylinders and a turbocharger. Our pick is the 114bhp version (badged TSI 115). It feels more than a match for the Kia Stonic 1.0 T-GDI, pulling well from just below 2000rpm and revving to its limiter with plenty of vim. You’ll not find it wanting, whether you’re getting up to speed on the motorway or going to overtake along a country road. Don’t write off the entry-level 94bhp (TSI 95), though, particularly if your everyday motoring centres mainly around town, where it serves up enough performance at low revs to see you cleanly away from the traffic lights. It’s just a little breathless at higher revs, though, and you need to work it quite hard to get it to 70mph. However, once there, it’ll cruise happily enough. The T-Cross offers the best all-round ride comfort in the class. It’s set up to be a little softer than the Arona and quite a bit squishier than the Stonic so, when you find yourself on a beaten up section of road strewn with potholes, it breezes over them with considerably less clomping than its rivals.It’s also much less fidgety than the Stonic is on the motorway. Compared to the C3 Aircross, meanwhile, which is set up softer still, the T-Cross remains much more controlled over dips and crests taken at speed. The Citroen’s rather undisciplined body control allows it to get quite bouncy. Usually we’d suggest sticking with the smallest wheels possible for the smoothest ride. With the T-Cross, though, wheel size makes little difference; our recommended SE trim comes with 17in wheels, but even the R-Line models with 18in wheels still ride well. The T-Cross’s tidy handling will suit a broad spectrum of buyers. Those looking for something easy to drive in town will find its light steering a treat, while those who relish a blast through the twist and turns of a country road will find it free of vices. 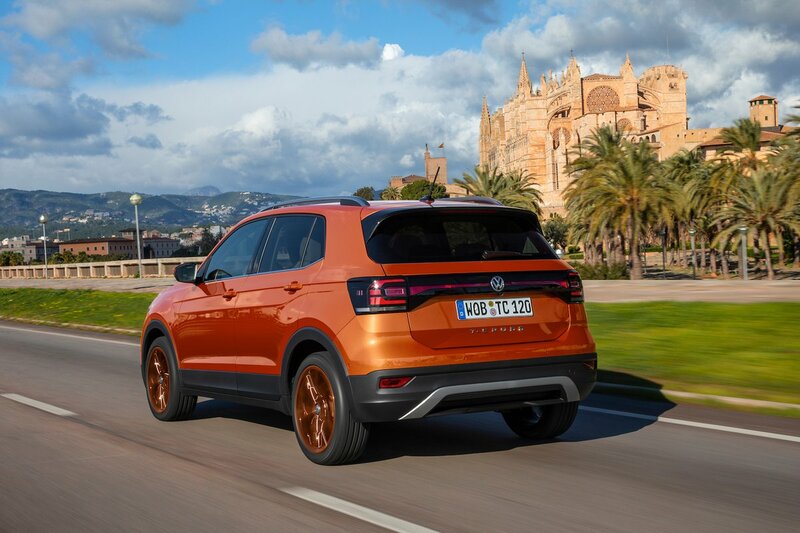 It’s not quite as tidy to drive spiritedly as the stiffer Seat Arona, but its steering weights up nicely when you pick up the pace — providing a good sense of connection to the front wheels — and there’s more than enough grip available. Both three-cylinder engines are quiet at low revs but produce a distinctive chirp when revved. They’re not coarse by any stretch, though. At 70mph you’re aware of some tyre roar, especially in cars with the biggest 18in wheels, as well as some wind noise from around its door mirrors. Compared with its peers, though, the T-Cross does a decent good job of isolating you from the outside world. Calm, relaxed driving comes naturally to the T-Cross. Its clutch has an identifiable biting point that makes pulling away quite graceful, while its brakes feel progressive and make drawing to a gentle halt easy. The manual gearbox has a light, if slightly rubbery shift action, while the optional DSG automatic ‘box pings though its gear seamlessly.